Java temples are numerous, they scattered all over the island of Java. Mostly located in Central and East Java. The purpose of the temples was to honor royal lineages as well as the higher gods but they built by regional people and local society. And served as a center where a king could demonstrate his spiritual superiority, his connection to the higher gods and knowledge. These high knowledge can you see on the sculpture that covered the walls of the temples. These are the evidence that people in that time are a higher learning. In a little more than 200 years, the mountain sides and plains of Java were covered by temples. 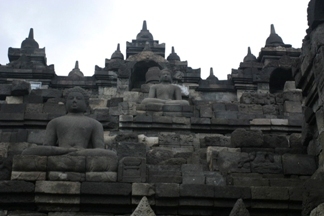 These temples were built during the golden time of Srivijaya , the king of Java in seventh century. In the mean time Borobudur was built by Sailendra, the closest allies of Srivijaya. Borobudur is a Buddhist monument and one of the wonders in the world. After Islam came to Java, the temples were simply abandoned. In this day the temple were more as a monument than as a spiritual place for gods. It’s different than Bali temples, where the temples are still used as a place to pray for the gods. It’s because the most people in Bali are still Hindu’s while in Java the most are Islam. And don’t forget to visit the temples in East Java, they have also interesting temples like Badut temple and Singosari temple near Malang, one of the finest city in East Java, with comfortable climate.